Even though I live thousands of miles away from her, I still forget that most of my friends here in Ireland have never met my sister. For the last several years, we lived fairly close to one another in Los Angeles and shared a good number of friends, so it’s a strange thing that many of my new friends here have little clue about my other half. I say “other half” because we’re identical twins, a detail that I often forget to mention and which always elicits expressions of shock and awe. 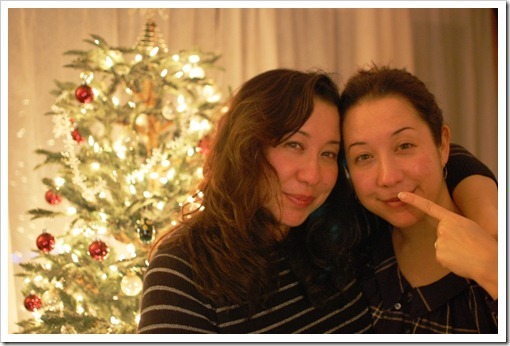 I usually refer to her as my sister in conversation as it never occurs to me to specify twin sister. I think for a lot of people it’s hard to grasp that there is another person who looks just like me and who walks and talks a lot like me out there in the world somewhere. It’s essentially telling people that I have a clone, a true, genetic clone. Of course since I’m used to being a twin, I don’t think it’s that big a deal. 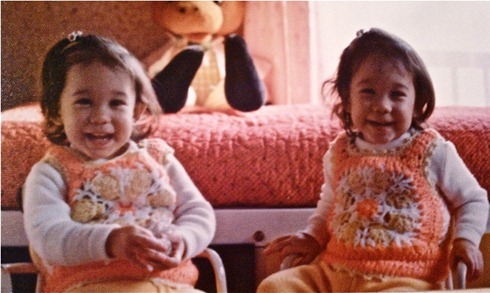 Assuming people know about her is second nature to me, because for the first 18 years of our lives, everyone always knew us as “The Twins,” something all twins generally get called by their schoolmates. Some seriously lazy classmates of ours used to refer to us as “Clann,” a combo of our names Clare and Anne. And the first question people ask when seeing me is “Which one are you?” My favorite answer for that question is, “That’s her (while pointing to her), and this is me (while pointing to myself).” Other times, if I was without my sister (or her without me) they’d ask, “Where’s your sister?” Even though our parents did a great job raising us to be individuals (they only dressed us in matching clothing up to the age of five and put us in different extracurricular activities as kids), people still think one just can’t exist without the other. But we can and we do. Back in the ‘90s my sister up and moved from Los Angeles to Tokyo, where she stayed for seven years (I was living in San Francisco for most of that time). It was a world apart, but we talked all the time (our phone bills were INSANE) and visited about once a year. Now it’s my turn to be the one on the other side of the planet, and thanks to cheap calling cards and the Internet, it’s easy to keep in touch. Still, it’s not the same and it’s a bit sad to think there’s this whole life here in Ireland she can’t experience day-to-day. She visited last May with her husband, but that was before I was really settled in, before I met Mountaineering Man (who she is dying to meet of course!) and before I felt truly familiar with my surroundings. I’m looking forward to her next visit, which will hopefully be sooner than later. Being a twin can be trying at times (I wasn’t so crazy about the “Clann” name), but it’s fun for the most part. 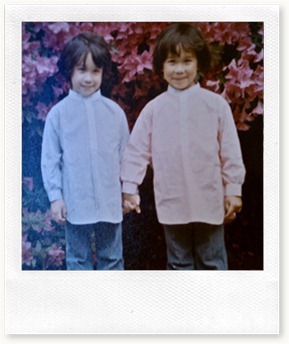 I won’t lie: we enjoyed the “perks” of being twins and maybe took advantage of it from time to time. In high school, we switched classes a few times – she’d go to my History 101 class and I’d slip into her desk in Advanced Spanish – but it was all in good fun. It always amazed us how people completely fell for it, even though there are very distinct physical and personality traits that distinguish one from the other. My best friend could be sitting next to Anne in my History class and not notice for the first half-hour that it wasn’t me; if all the other elements remain the same (the desk, the time of day, the classroom) that one, huge detail (it being Anne and not me!) would go unnoticed. But if my sister went over to my best friend’s house for a visit and tried to pass herself off as me, it would never work. 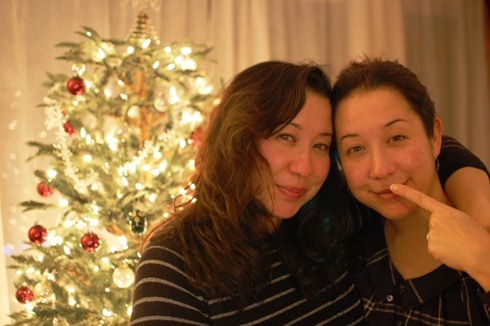 “That’s her and this is me!” My sis and I at Christmas in Los Angeles last year. I’ll admit that we also get a kick out of people’s freaked-out faces when they see us for the first time, either together or separately. Several years ago I was covering SXSW, a music festival in Austin, Texas, and a man came over to me and started to give me a hug. I had no idea who he was and my alarmed state confused him. “You must think I’m Anne, right?” I asked. 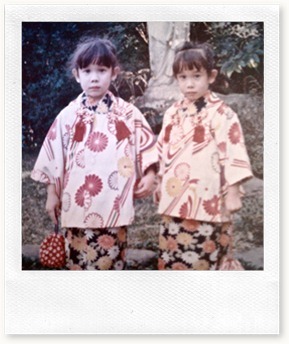 Turns out he knew her in Japan and had no idea she was a twin. Recently my sister was at a music concert in Los Angeles when someone she never met walked over and started talking to her. His reaction when she told him? “Are you shitting me?” He later sent me an email saying basically the same thing. “I thought she (you) was pulling my leg at first!” he wrote. Happens all the time, I told him. I wonder how long it will be before it happens here in Ireland? 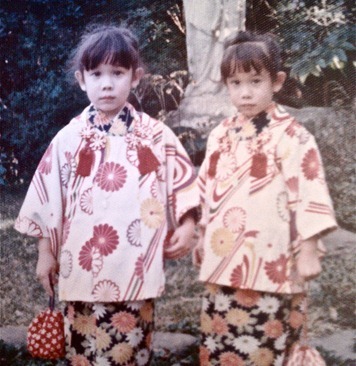 My sister and I were born in Japan and spent the first five years of our lives there. 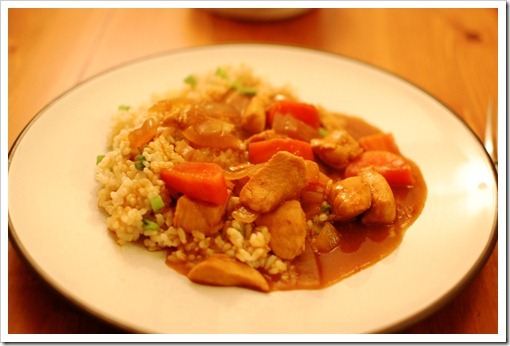 Our hands-down favorite meal was the basic Japanese curry dish, always made with chicken, onions, potato and carrots in our house. My mom served it over sticky rice or if we had leftover curry she’d pour it over spaghetti for a quick Saturday lunch. Japanese curry is quite mild and has a slightly sweeter taste than Indian curry, which I think would be appealing to the Irish palate. I made this for MM the other night and he gave it a thumbs-up! You can buy Japanese curry at most Asian markets (I get mine at Drury Street Asian Market in Dublin or at the English Market in Cork). It should also be noted that my sis has her own food blog, the very cool and fab Tuna Toast! In a large pot, heat the oil over medium-high heat. Place the chicken in the pot and brown on all sides but don’t cook through; remove chicken from the pot and set aside. Add the carrots, onion and potatoes into the pot and cook for about 4-5 minutes or until onions start to get tender. Put the chicken back into the pot with the carrot/onion/potato and add the water. Turn the heat up high and bring to a boil, then lower the heat to low. Break up the curry into cubes and add into the water, stirring until the curry has fully dissolved. Let simmer for 5-10 minutes over lowest heat setting and serve over steamed rice. Enjoy! This could be me! 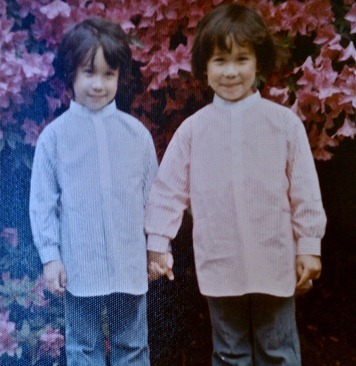 I’m an identical twin too, and played the same tricks you guys did in school. I live in a small area, where she is more well known than me. I’m so used to just saying hello back and asking who will I say I met that it’s become second nature now. I do find the identical thing a bit difficult though because of the assumption that you’re not an individual and as a result I can’t even wear the same colour in my clothes as her even if the clothes themselves are completely different! Love the pics 🙂 Love the shout out to SXSW 🙂 I have sisters who are twins, but not identical…not near as much fun…lol. I assume that someone may have told you that Clann is the Irish word for family. Ooh, sounds lovely! I’m a big fan of the katsu curries in Wagamama et al, would love to try this at home. An ciotog: It’s strange how, if we wear completely different clothes but of the same color people will say stuff like “Wow I can’t tell you apart today! ?” That kind of comment always gets an eye roll or two from me and my sis. Susan: Oh I looooved that SXSW experience (my first!). Saw Elliott Smith do a very intimate performance in a small club, it was incredible. 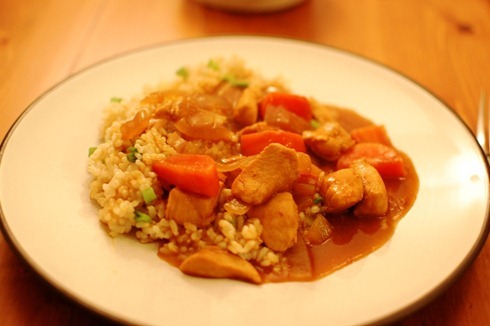 Catherine: Katsu curry is one of my faves too. I will make katsu here on the blog soon and share the recipe now that I’ve found panko (Japanese breadcrumbs). Awwww 🙂 I love the pics of you and your sis, so cute. You really are amazingly identical! Hope we get to meet her someday soon. Aoife: I hope so too! I didn’t really know any of you bloggies when she came last time so next time for sure! 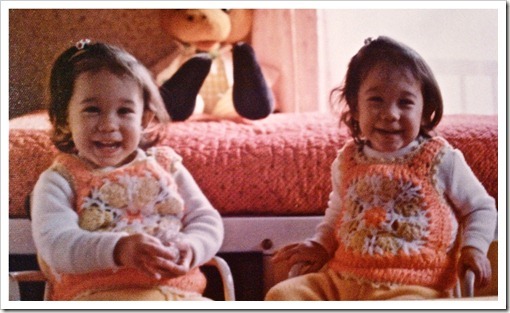 Miki: I thought you two looked so identical when you were younger. I still remember that time you visited and we all walked to Thrifty’s and got ice cream and ate WAY too much of it. 🙂 Congrats to you and your hubs on your beautiful little baby by the way! An American in Ireland is powered by	WordPress 4.5.17 and delivered to you in 0.267 seconds using 45 queries.